Here are a couple of movies related to Scotland that I watched recently. Here is a video I found on YouTube that features a hauntingly beautiful song called "Ailein Duinn", from the movie. It's sung by Karen Matheson of Capercaillie. I don't know what the words mean, but I think the song is lovely. And these photos of Scotland are wonderful. I heard about the movie "Stone of Destiny" several years ago from Cathy MacGregor on Compuserve. It's not a very well-known movie, and rather hard to find on DVD, but worth watching, in my opinion. This Canadian film tells the story (based on real events) of four Scottish university students in 1950 who plotted to steal the 9th-century Stone of Scone from Westminster Abbey in London and bring it back to Scotland. Read the review here if you're interested. "Stone of Destiny" is a rather low-key movie with a sweetly innocent feel to it ("What could possibly go wrong?" says one of the conspirators). Not a very long movie, either, only 96 minutes, and it moves pretty quickly. I found the Scottish accents a bit hard to follow at times, but that may just have been because I'm not used to hearing them. The movie was well-acted and I would certainly recommend it to OUTLANDER fans. You can find it on DVD here or here. Unfortunately, it doesn't seem to be available on Blockbuster or Netflix, which is a shame. If any of you know of any other films with a Scottish theme or filmed in the Highlands that are worth watching, please let me know. "Mrs. Brown" is one, although I haven't seen it in years. "Braveheart", of course (although I personally didn't care for that movie). Any other suggestions? Another Song from "OUTLANDER: The Musical"
If you enjoyed the brief song samples from the "OUTLANDER: The Musical" CD, you may be interested to know that another full-length song from that CD, "I am Ready", is available for download from the web site of Allan Scott-Douglas (who sings the part of Jamie in the musical). I like this song quite a bit. The Scottish accent, especially. <g> Click here to listen to it. If you are thinking that it's weird to hear Jamie singing -- given that we know he is tone-deaf and can't sing -- you're not alone. Diana's response on her blog yesterday to someone who made a similar comment was interesting, and worth reading. UPDATE 7/28/2010 3:41 pm: Diana has posted some additional information on her blog about this Saturday's performance of the songs from "OUTLANDER: The Musical" in Aberdeen, Scotland. This is from a short story (well, all right, it's 25,000 words, but still...) I've just done for an anthology. 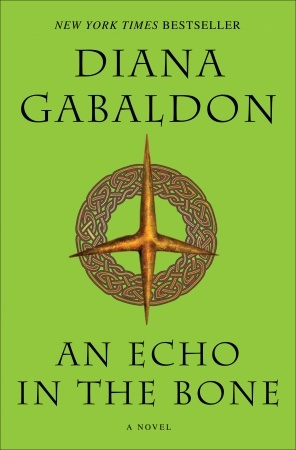 The story was originally called "Terror Daemonium" and is the story of what happened to Michael Murray (the middle brother, between Young Jamie and Young Ian, Janet's twin) and to Joan MacKimmie (Laoghaire's younger daughter; Marsali's sister) when they went to France at the end of AN ECHO IN THE BONE. I later changed the name to "The Space Between", but it'll be up to the anthology editor as to which title he prefers. Please keep in mind that I don't read excerpts! If you'd like to discuss this story, there's a thread on Compuserve here, or you can post on the LOL Excerpt Board. Thanks. The mp3 version of "Is Tu Fuil ‘o Mo Chuislean" ("Blood of My Blood"), which Diana says you are welcome to download and share with your friends. Brief bios of the songwriters, Mike Gibb and Kevin Walsh. I would encourage you to check it out! If you don't know what this is all about, read the explanation on Diana's web site. CDs will be available for purchase starting August 1, but you can pre-order now, as I did, through PayPal, by following the instructions on the OutlanderTheMusical site. Please spread the word to anyone else you think might be interested! If you are on Facebook, there's an "OUTLANDER: The Musical" group here. There are a great many other Celtic prayers, charms, and blessings listed in the Carmina Gadelica. Not all of them are as solemn as the ones mentioned above. Here, for example, is the "Cud-Chewing Charm", from Volume II of the Carmina Gadelica, which Roger notes briefly in ECHO (p. 458 hardcover ed.) And there are several different blessings for smooring a fire. If you want to see more from the Carmina Gadelica, look here for volumes I and II, and here for volume III. Check out Diana's latest blog entry, which is mainly talking about the new German edition of the OUTLANDISH COMPANION (DER MAGISCHE STEINKREIS) but also includes a very funny scene from THE FIERY CROSS that does NOT appear in the English edition of the book. I thought it was hilarious, but go read it for yourselves and see what you think. Diana Gabaldon posted more detailed information on Compuserve yesterday about the OUTLANDER song-cycle (titled "OUTLANDER: The Musical"), including information on how to order a copy of the CD that goes on sale August 1. The CD will be available mail order from 1 August but advance orders are now being taken. The CD costs £10 plus £1.00 postage (UK only) and US$15 plus $4.00 postage outside the UK. Payment can be made to info@hamepages.com at Paypal. Anyone unsure on how to make payment please contact me at the above email address and I’ll happily guide you through the process. 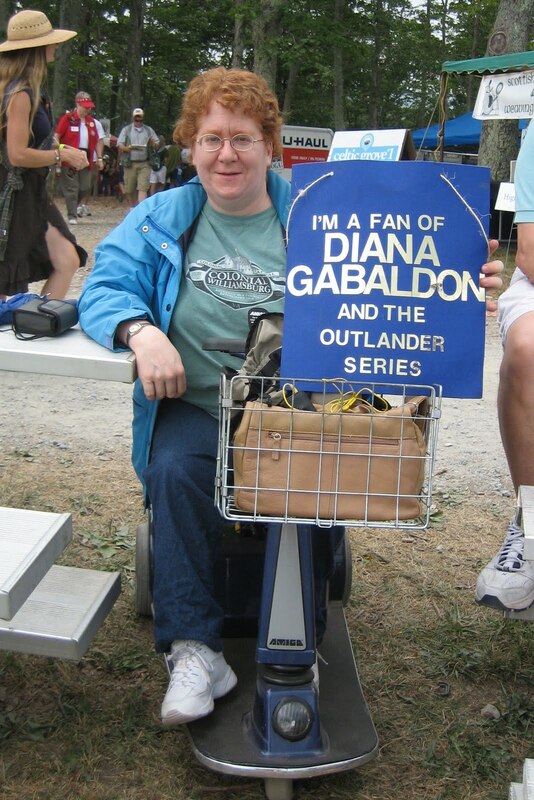 At the moment, there is not yet a web site for the OUTLANDER CDs. 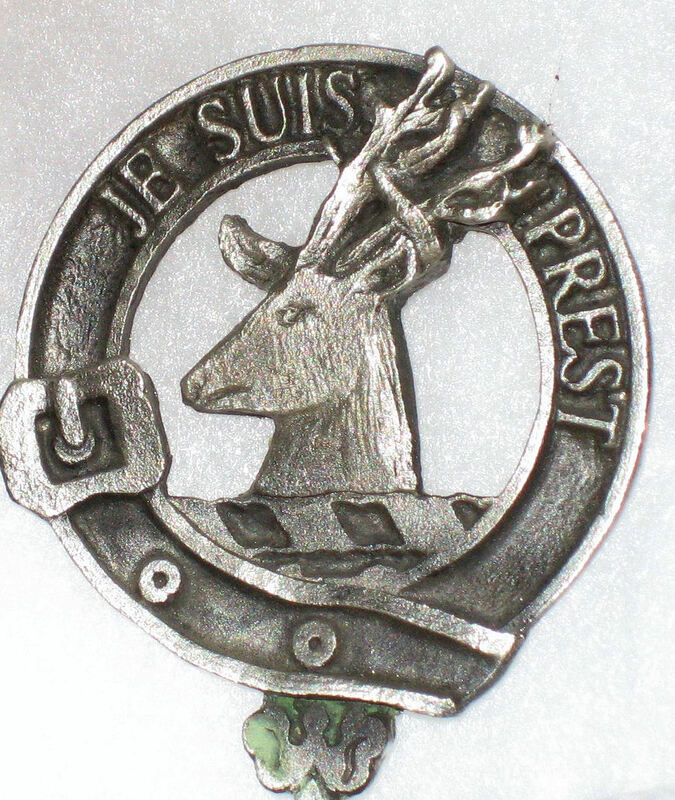 You can do what I did, and send a payment via PayPal to info@hamepages.com, including your name and mailing address and specifying that it is for the OUTLANDER CD. Is tu fuil ‘o mo chuislean, is tu cnaimh de mo chnaimh. Is leatsa m’anam gus an criochnaich ar saoghal. Based on what we've heard so far, and the list of song titles that Diana provided in her post on Compuserve, I'm very excited to hear what the rest of the album sounds like. Two more weeks, and then we'll all find out! UPDATE 7/23/2010 6:40 am: For more information about "OUTLANDER: The Musical", check out the official web site, outlanderthemusical.com. I've redesigned the site badge for Outlandish Observations. I was getting very tired of looking at the old one. Let me know what you think. And feel free to copy the code below if you would like to put my badge on your own site. Diana Gabaldon's book-tour schedule for the upcoming graphic novel, THE EXILE, has been posted on the Random House web site, here. According to the site, tour dates are 9/21-10/8. Cities on this tour include Denver, Tucson, Kansas City, three different locations in California, and two locations in New York -- ending with Comic Con in NYC on October 8th. I know a lot of people are already very excited about that! The details are subject to change, of course, so please check that site for further updates. In case any of you are wondering, no, I won't see Diana on this book-tour. But I'm planning to go see her in Winston-Salem, NC, on Sept. 11, at the Bookmarks Book Festival. Very much looking forward to that! For those of you who are wondering how and why the locations are chosen for Diana's book-tours, read this. And remember, even if you won't get a chance to see her on this tour, you can still order autographed copies of all of Diana's books through the Poisoned Pen bookstore in Scottsdale, AZ. Diana says they ship all over the world. 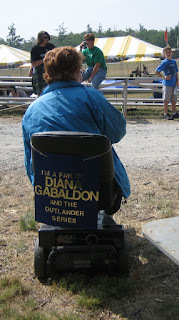 Diana Gabaldon posted something verrrry interesting on Compuserve yesterday. Go here and click on the file attached to the message to listen to it. Or right click on the attachment and click Save Target As... (in Internet Explorer) or Save Link As... (in Firefox) if you want to download a copy for yourself. Diana got permission to make this particular song available as a free download, but if you want to hear the rest of the songs in the collection, you'll have to pay for them. Watch for the official announcement, with all the details about the project, including how you can order CDs, on Diana's blog and/or web site in the next few days. If I hear anything further, I'll post updates here. Do take the time to listen to this. I think you'll like it! UPDATE 7/13/2010 1:17 PM: Diana has posted an announcement on her blog about this, with some more details. 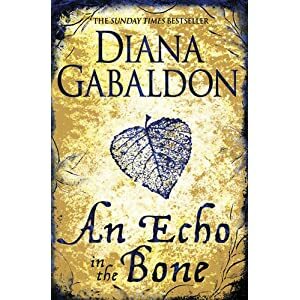 UK readers take note: Diana Gabaldon posted some additional information about the mass-market (small size) paperback of AN ECHO IN THE BONE on her blog last week. 4) An excerpt from Book Eight, which tells you What Happened to Jem in the Tunnel. Note: If you want to read or discuss the excerpt, go look at Diana's blog. Please keep in mind that I don't read Book 8 excerpts. Thanks! I would like to see #2 and #3, but the chances of my ever seeing this particular edition of the book are pretty slim. Still, I think it's great that the UK readers are going to get some extra "goodies". Seems to me it's the least Orion can do, after that frustrating and inexplicable four-month wait for ECHO's hardcover publication in the UK! You can pre-order the UK mass-market paperback from amazon.co.uk, here. I'm back! I had a WONDERFUL time at the Grandfather Mountain Highland Games on Friday, and although I didn't manage to meet up with the group from LOL after all (due to some logistical confusion), I chatted with at least a dozen different OUTLANDER fans during the course of the day. I missed Albannach, but did get to hear Alex Beaton perform, and I bought a CD of his songs, which we enjoyed very much on the way home. We stopped for about an hour at midday while I plugged in my scooter's battery charger at one of the tents. While we were waiting, my mom went and got us lunch at the only Scottish-food vendor in the place. We had bridies, haggis, and chips. The haggis was surprisingly good, given its reputation, and we concluded that it's probably better not to think about what's in it or how it's made. <g> And I had asked for a bridie specifically because of the references to them in the books. It was delicious. While we were eating lunch, we watched this woman spinning yarn with an old-fashioned pedal-operated spinning wheel. 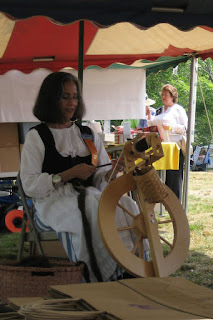 It looked to me like something that Brianna or Marsali might have used in the 18th century. 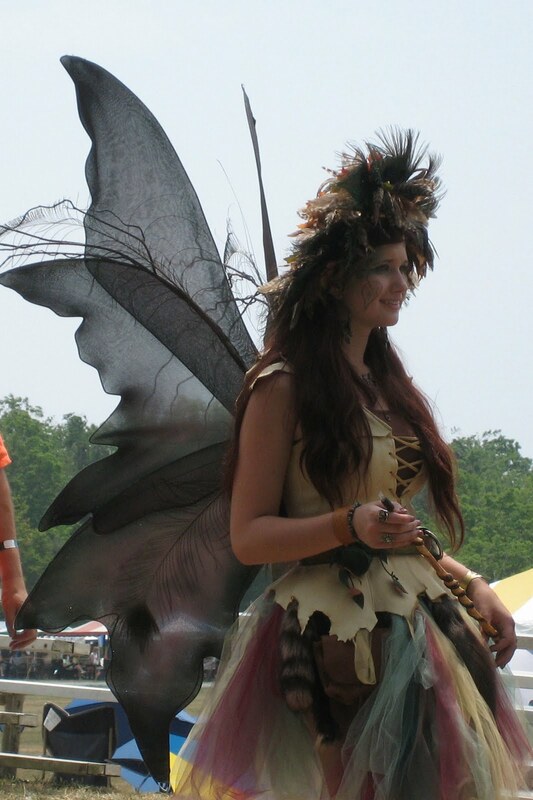 We had a wonderful time and I would not hesitate to go back again next year! 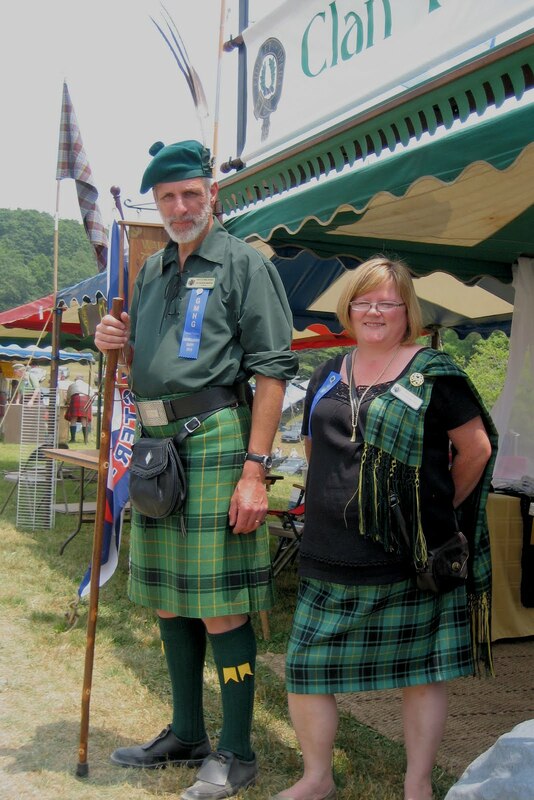 So my parents and I are getting ready to go to the Grandfather Mountain Highland Games later this week, and my mom, who knows nothing about Scotland, is getting very curious about the whole thing. 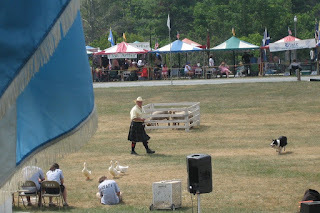 She asked me yesterday, "What exactly is a Highlander?" Loooonnng pause, while dozens and dozens of images, scenes, quotes from the OUTLANDER books flashed through my mind. 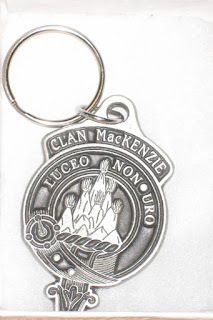 :-) We have no Scots ancestry at all,, and although I did try to get my mom to read OUTLANDER once, about three years ago, her reaction was rather tepid and I don't think she remembers much. (Oh, well. Maybe I'll try again, after we get back from this trip.) How best to explain, succinctly? 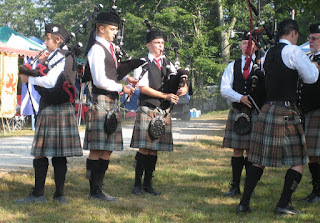 Finally I said, "They're from the northern part of Scotland. In the mountains, you know? 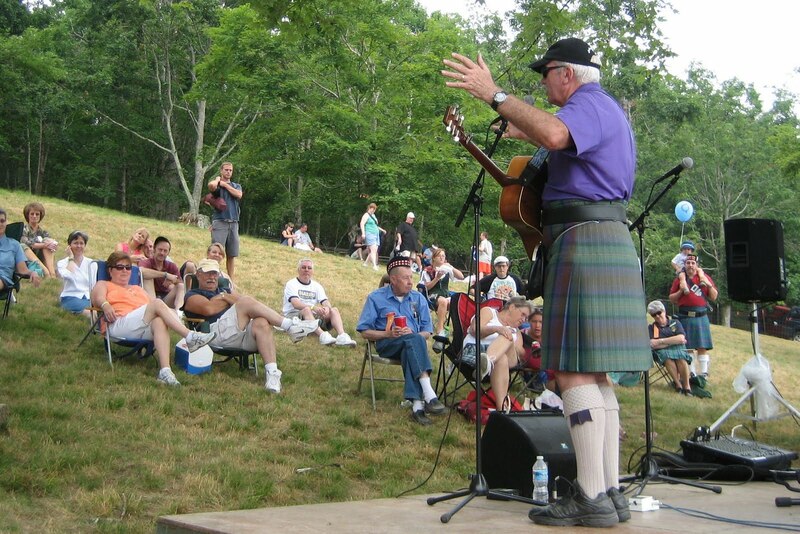 And traditionally they were the ones that wore the kilts and such." How would YOU answer that question, if you were talking to someone who knew nothing whatever about Scotland, or Diana Gabaldon's books? Are there particular scenes or quotes that come to mind when you think of the word "Highlander"? "A Highlander in full regalia is an impressive sight--any Highlander, no matter how old, ill-favored, or crabbed in appearance. A tall, straight-bodied, and by no means ill-favored young Highlander at close range is breath-taking. The thick red-gold hair had been brushed to a smooth gleam that swept the collar of a fine lawn shirt with tucked front, belled sleeves, and lace-trimmed wrist frills that matched the cascade of the starched jabot at the throat, decorated with a ruby stickpin. His tartan was a brilliant crimson and black that blazed among the more sedate MacKenzies in their green and white. 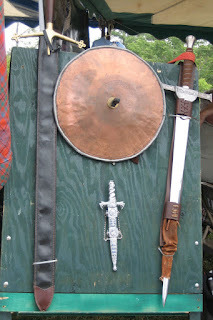 The flaming wool, fastened by a circular silver brooch, fell from his right shoulder in a graceful drape, caught by a silver-studded sword belt before continuing its sweep past neat calves clothed in woolen hose and stopping just short of the silver-buckled black leather boots. Sword, dirk, and badger-skin sporran completed the ensemble." What about the rest of you? What images, quotes, scenes, etc. from the books best describe what a Highlander is? 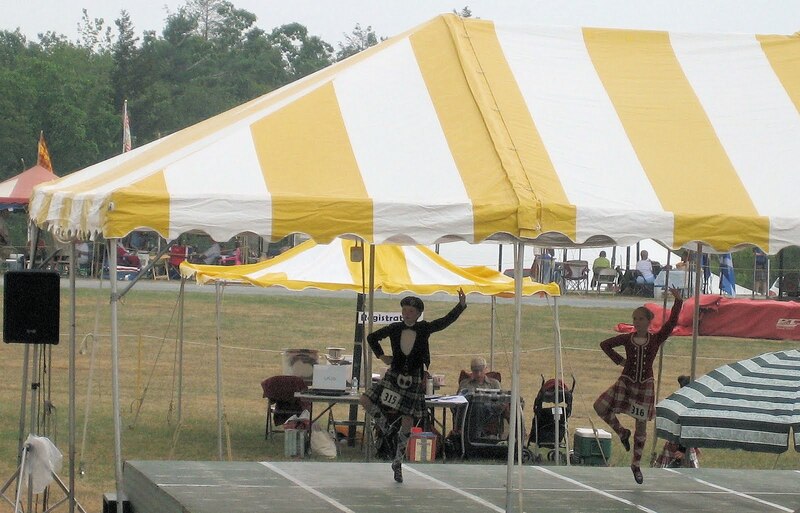 So I was spending the 4th of July at my parents' house, and my mother happened to mention that she'd seen an article in the local paper about the upcoming Grandfather Mountain Highland Games, scheduled for July 8-11. She wanted to know if I was interested in going. Well, naturally, I said, "Of COURSE I'm interested!" <g> I've never been to a Highland Games or any other type of Scottish festival, although I've heard a lot about them. We were joking about what clan we would belong to -- my entire family ancestry is Eastern European Jewish on both sides, no Scots anywhere that I know of <g> -- and to my utter astonishment, my mom said, "I have an old plaid that my mother brought back from a trip to Scotland years ago." So she went and got it out of the closet, and it turned out, to my amazement, that what she had was a hand-woven MacKenzie tartan! Somewhere up there, my grandma is looking down at us, and smiling. We miss you, Grandma, and thanks so much! 1) "But, Mr. Adams" - Jefferson, Adams, Franklin, and others argue about who should write the Declaration. 2) "The Egg" - Franklin, Adams, and Jefferson choose America's national bird. 3) "Sit Down, John" - This is the movie's opening number. If you like what you see here, you can get "1776" via Amazon here. It's also available on Netflix and Blockbuster. Hope you enjoy it as much as I do! Check out Diana's latest blog entry for some great news about how well the Green Slime (aka U.S. trade paperback) version of ECHO has been selling so far. I opened my email this morning to hear that the new Green Slime edition has hit the New York Times list—I _think_ that’s the first time one of my trade paperback editions has done that! It’s also #4 on BookScan’s bestseller list, mentioned in USAToday (today), and has stunned the publisher (in a happy way [g]) by selling lots more copies in its first week than the trade paper edition of A BREATH OF SNOW AND ASHES did—and they thought _that_ was good! So, it looks like all of our (collective) efforts to get the word out have been paying off! Whatever the reason, this is excellent news, and I wanted to make sure people here were aware of it, too. If you haven't yet bought a copy, see Diana's blog entry for details about a special promotion that Borders is running.